With an extraordinary talent of memorizing melodies in minutes, mezzo-soprano, Josefina, has found herself absorbed in the music realm for nearly twenty-four years. From various choirs, musicals and plays – to summer bands and solos, piano to guitar, she has immersed herself in her craft with serious passion and determination. In recent years Josefina has become a part of Penn State Altoona’s Ivyside Pride Choir, under the direction of Canadian contralto, Dr. Bonnie Cutsforth-Huber. Alongside her Ivyside Pride members, she has performed Verdi’s Requiem, in the style of The Defiant Requiem - as performed by the members of Terezín Concentration Camp during World War II - under the direction of the great Murry Sidlin and the brilliant pianist Arlene Shrut at Fisher Auditorium at the Indiana University of Pennsylvania (2019); Mozart’s Requiem - under the direction of Dr. Bruce Chamberlain with the New York City Chamber Orchestra at Carnegie Hall (2017); performed a solo in Carmina Burana (2015), joined Dr. Bruce Chamberlain and the New York City Chamber Orchestra - for Maurice Durufle's Requiem at Avery Fisher Hall, Lincoln Center (2014); and joined Moving Ahead Productions – with nearly 100 additional chorister and musicians – to perform Andrew T. Miller’s Christmas cantata, The Birth of Christ, at St. Stephen’s Cathedral - Vienna, Austria (2013). Josefina’s extensive choral work extends far past Ivyside Pride, having been apart of eight additional choirs such as SSSV's Choral Ensemble, The Grier School’s Girls Choir, Joy Siddons’s Vocal Choir, The Genesis Choir for Children, the St. Andrews Bell and Vocal Choir, the Cherub Choir for Children, Cherub Chimes – Bell and Vocal Choir, and the Lewinsville Presbyterian Church’s Joyful Noise Vocal Choir, performing all over the Washington, D.C area. In addition to her time a chorister, Josefina has also frequently appeared in musical productions. Roles have included Matron Mama Morton for The Grier School’s production of Watkins, Ebb and Fosse’s Chicago and as Elphaba for The Wizard and I and Defying Gravity, in independent solo shows. As part of musical ensembles, she has appeared for Chicago, as well as, Burrows and Swerling’s Guys & Dolls. Seen in smaller bands, she has covered Lady Antebellum’s Need You Now, Vanessa Carlton’s A Thousand Miles, Coldplay’s Viva La Vida, Leonard Cohen’s Hallelujah, Charlotte Church’s renditions of Carrickfergus, A Bit of Earth, and The Laughing Song, with Celtic Women’s Caledonia, The Voice, Siulil A Run, Mo Ghile Mear, Celine Dion’s Loved Me Back To Life, Goodbye's The Saddest Word, My Heart Will Go On and Water From the Moon, as well as local performances of Spirit of Peace and Light of Love, with a few various Christmas productions throughout the years. She is well versed in today’s pop culture music, musical theatre and choral works. Today, while a majority of her musical selections drift between Celtic/Gaelic pieces and well-known musical theatre, she has started her training for operatic roles. 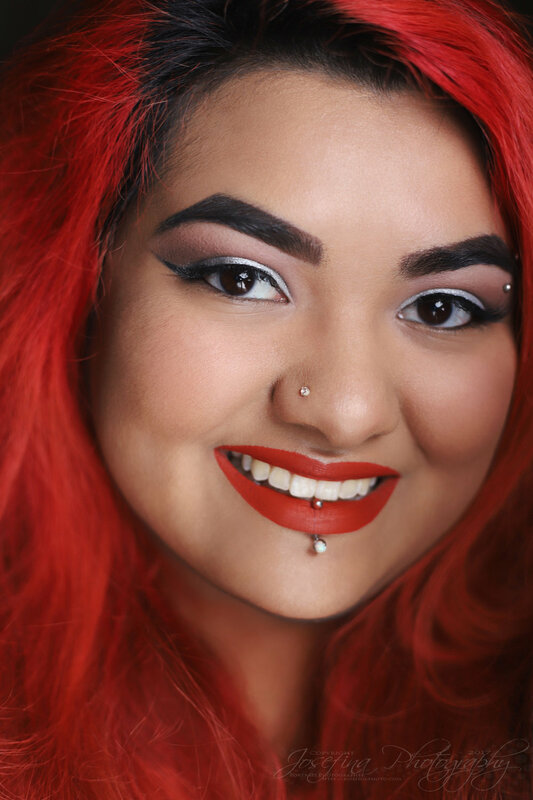 Josefina is a current student at Penn State Altoona University studying for a minor in World History and is moving toward the finishing stages of a double major in Psychology and Integrative Arts – Vocal Track, working closely with voice teacher, Dr. Bonnie Cutsforth-Huber. She hopes to pursue her studies further in grad school to become a Music Therapist for children and those suffering from various forms of PTSD. When she is not singing or studying, she is actively pursuing her other passion and career as an internationally published celebrity, fashion and portrait photographer.